Another wash day has come and gone. While I'm 12 weeks post relaxer, there's nothing new or exciting to report outside of getting to use one of my new oils, grapeseed oil, in my hot oil treatment. I have been battling with dryness, especially on my ends, so I was happy this was a co-wash day. The co-wash that I use usually gives me a boost of moisture. 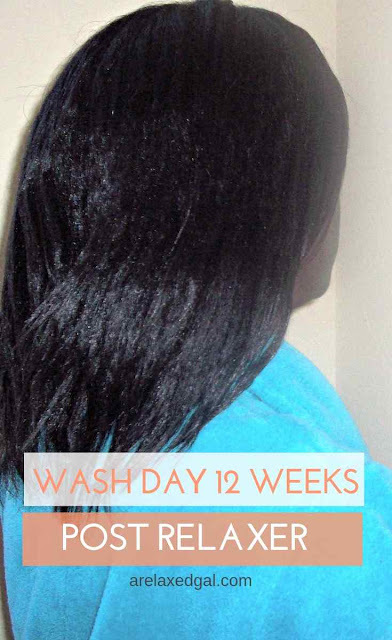 Keep reading to get the details of my wash day. I started off this wash day by pre-pooing with a hot oil treatment made up of grapeseed oil, coconut oil, and Jamaican black castor oil on my scalp and strands. 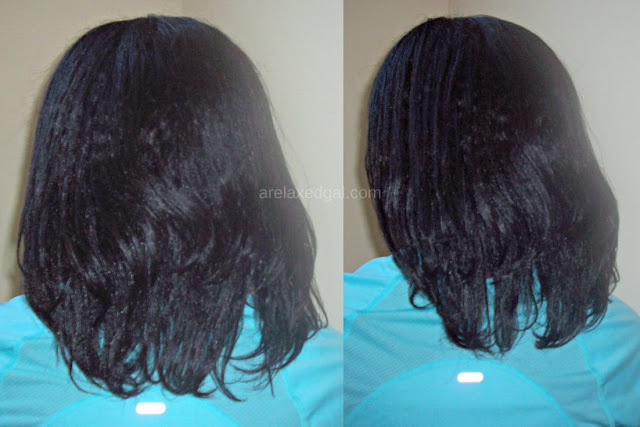 Once my relaxed hair was oiled up I finger detangled, applied Eden BodyWorks Jojoba Monoi Deep Conditioner on top of the oil and wore my hot head cap for about an hour. Next it was time to co-wash with Eden BodyWorks Coconut Shea CoWash. I really like this stuff as it has slip and cleanses without stripping my hair. I did a green tea rinse next that was mixed with a teaspoon of apple cider vinegar. I realized I hadn't been using my apple cider vinegar much anymore and wanted to bring it back into the line-up. I used an applicator bottle to apply the green tea and apple cider vinegar mix. This helped me focus on getting the mix on my scalp and not my hair. To make sure that my hair didn't get stripped of any moisture I did a quick condition with Suave Natural Infusions Moisture Conditioner on top of the green tea and apple cider vinegar mix and let it sit for about five minutes. Then I rinsed with cool water, wrung out my hair and then wrapped it up in a t-shirt for about an hour. 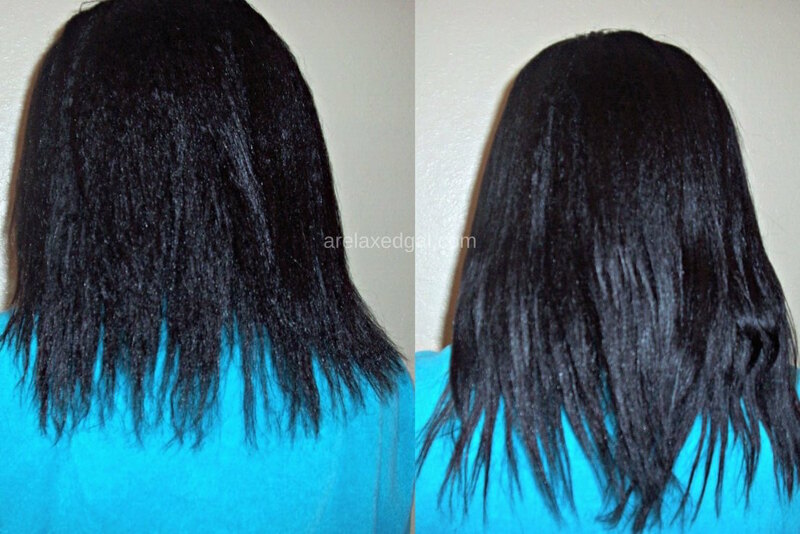 I finished drying by applying Nothing But Melted Shea Butter Leave-in Conditioner mixed with grapeseed oil and then sitting under my hooded dryer for 1 1/2 hours. You can see my damp hair in the picture on the left. My completely dried hair is in the picture on the right. I completed my wash day by cross wrapping my hair and going to bed. In the morning I was hoping that my ends, or the rest of my hair for that matter, didn't feel dry. I wasn't disappointed. My hair felt great. So great that I decided to curl the ends with my Caruso Steam Rollers and wear it down. To style my hair with the steam rollers I divided my hair into seven big sections. In the top sections, I used the large sized rollers and held them in place with claw clips. I use claw clips for the hair on top of my head to avoid having any indentations that the roller covers tend to cause. For the bottom sections, I used the jumbo sized rollers. To hold them in place I used the covers that came with the rollers because I don't care if the covers create any indentations they are covered by the top layer of hair. You can see what my curled hair looked like in the picture below. Once I got home though my hair went up in my satin cap. 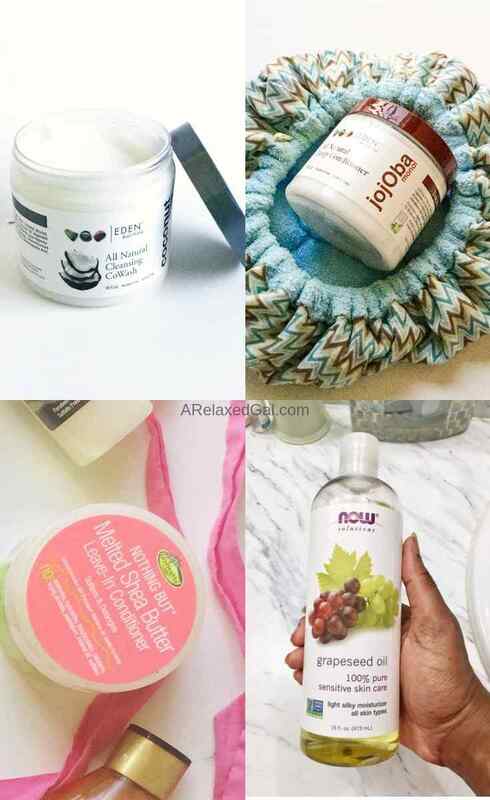 What products do you use to keep your hair moisturized? I haven't done a hot oil treatment in forever! Your hair has a great shine! Love the shine of you hair from the hot oil treatment!